The Iowa Barnstormers were unable to extend their winning streak last week as they fell to the number two team in the American Conference-South Division, the Orlando Predators. The Predators came out strong against the Barnstormers as they jumped to a quick 16-0 lead in the first quarter. The teams exchanged scores in the second quarter, entering halftime 36-20. 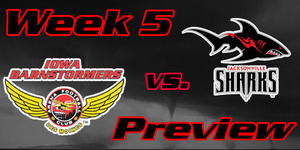 The Barnstormers came out ready for a second half comeback but were unable to match the strength of the Predators. With QB Brian Lee-Lauduski at the helm, Iowa took control of the fourth quarter, outscoring Orlando 27-20. However, it wasn’t enough to close the gap and the Predators took the game with a 77-61 victory. The Iowa Barnstormers (3-8) travel to the desert this week where they will take on another top-seated team, the Arizona Rattlers (10-2). The Rattlers rank in the top 5 of nearly every statistical category, including being ranked second in the league for scoring and averaging close to 64 points per game. Among other things, Iowa will have to utilize its number 5-ranked rushing offense to help outscore Arizona. Injuries and both roster and coaching changes seem to have taken a toll on the Barnstormers this season. They will need strong leadership down in the Valley of the Sun to come out victorious. The Arizona Rattlers dominated the Utah Blaze last week with a 35-point victory. In what started out to be a close game, the Rattlers let loose in the second quarter to take the lead at halftime, 48-19. The third quarter proved to be another brutal one for the Blaze as they were outscored by 18 more points. Utah was able to ignite a little bit of spark in the fourth quarter, earning touchdowns on their first two possessions but it wasn’t enough. The Arizona Rattlers walked away with the win of 72-37 over the Utah Blaze and improved their record to 10-2, while Utah fell to a 5 -6 record. Iowa Barnstormers vs Arizona Rattlers will be broadcast LIVE on 1700 AM The Champ, on the Internet at www.theiowabarnstormers.com and at www.nifty-tv.com. -This will be the ninth meeting between the Iowa Barnstormers and the Arizona Rattlers in their franchises’ history. Arizona leads the series 5-3. In addition to being named JSL Ironman of the Game, Rodney Filer also earns the accolade of Barnstormer of the Week. Against the Predators, Filer rushed for a 35-yard touchdown early in the third quarter, breaking the 1,000-mark for career rushing yards. He is the ninth player in history to break the mark and is currently ranked eighth all-time with 1,023 total rushing yards.